A landmark book published to rave reviews a decade ago, Pearl Harbor Ghosts has now been updated to commemorate the 60th anniversary of the surprise attack that forever changed the course of history. Full of gripping drama and vibrant details, here is the intimate human story of the events surrounding that fateful day of December 7, 1941–the glamorous tropical city that seemed too beautiful to suffer devastation . . . the stunned naval personnel whose lives would permanently be divided into before and after Pearl Harbor . . . the ordinary Honolulu residents who were tragically unprepared to be the first target in the Pacific war . . . the Japanese pilots who manned the squadron of deadly silver bombers . . . and the island’s community of Japanese-Americans whose lives would never be the same again. Blending meticulous historic recreation with lively reporting, Clarke counterpoints the freeze-frame nightmare of the 1941 bombing with the disturbing realities of present-day Honolulu, where hundreds of veterans, both American and Japanese, converge each year to relive every hour of the attack. Wealthy Waikiki landowners and native Hawaiian farmers, admirals and nurses, Navy wives and government officials–all take their part in Clarke’s rich tapestry of memory and insight. In the end, Pearl Harbor emerges as a trauma that spread from Oahu to engulf the nation and the world–an event that continues to reverberate in the lives of all who experienced it. 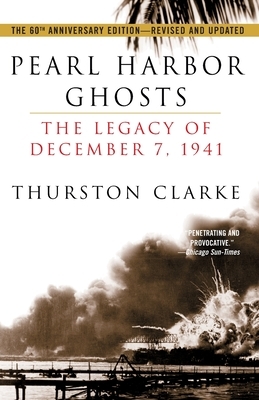 Thurston Clarke is the author of nine widely acclaimed works of fiction and nonfiction, including California Fault, a New York Times notable book; Equator; By Blood and Fire; Pearl Harbor Ghosts, the basis for the CBS Pearl Harbor documentary; and the bestselling Lost Hero, which was made into an award-winning NBC miniseries about Raoul Wallenberg. He has written for Vanity Fair, Glamour, Outside, Travel Holiday, Condé Nast Traveler, and numerous other magazines and newspapers. He is the recipient of a Guggenheim Fellowship, the Publication Award for the Geographic Society of Chicago, and a Lowell Thomas Award for travel literature. He lives with his wife and three daughters on Lake Champlain in upstate New York.